FRANCES T. DEAN, 92, of Shelburn, Indiana passed away on the morning of Sunday, October 21, 2018 at her home of over 65 years and departed for her eternal home to reunite with her loving husband of 51 years, Thomas A Dean Sr. In the hours before her passing she was surrounded by generations of family with the companionship and geneal spirit that is remembered by so many. While she only birthed 4 children (Kathy Miller, Thomas A. Jr [Glenda], Steven [Laura], and Francine Stienstra [Bruce]), resulting in 10 grandchildren, 28 great grandchildren and 6 great-great grandchildren, their are literal multitudes who fondly remember their Grandma Dean and all of the good times spent on the farm. Of those, Thomas Glenn Dean and Everyl Clinkenbeard, her husband Tom’s earlier children, have long been loving members of her large family. Frances was preceded in death by her mother (Catherine Schierman), father (Stephen Goshen), husband, son (Steven), all her siblings, and many many friends. While her presence will be sorely missed by her family here, after suffering in recent years from Alzheimer’s, today is a celebration for her as she has a happy homecoming with all those who have went before. Frances will always be remembered as a sweet, tender, kind and loving soul with an endearing sense of humor to the very end. Frances was a member of the Hymera United Methodist Church. 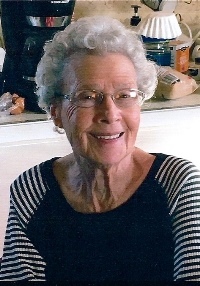 She enjoyed gardening, collecting recipes, working crossword puzzles, and clipping newspaper articles and photos of her family, neighbors and friends. Arrangements are entrusted to Michael W. Cox, Cox Funeral Home; 218 South Meridian Street; Jasonville, Indiana. Visitation is scheduled from 1 to 3 p.m. Friday. Funeral Services will immediately follow visitation at 3 p.m. Friday, October 26, 2018 at the Cox Funeral Home with Grandson Steven Dean and Pastor Chris Elmore officiating. Interment will be at K of P Cemetery in Hymera, IN.